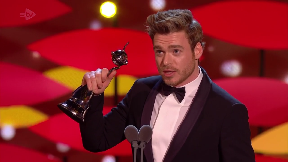 Richard Madden has won the prize for best drama performance at the National Television Awards. The Elderslie-born actor won for his role as Sergeant David Budd in the BBC drama Bodyguard, which also won the award for best new drama. Madden, 32, who rose to fame as Robb Stark in the HBO series Game of Thrones, paid tribute to co-star Keeley Hawes as he collected his award at the ceremony at the O2 in London. He said: "The biggest thank you goes to Keeley Hawes. You couldn't ask for a better, more talented actress." Madden saw off competition from Cillian Murphy, Jodie Comer, Jodie Whittaker and Michelle Keegan, who were also in the running for the award. Holywood legend Danny DeVito presented the award, telling Madden: "I really dig your show". The actor's next project will see him take on the role of Elton John's manager in Rocketman, a biopic about the singer's life set to be released in May.